I've had the honour of having my brake ducting article, albeit in a slightly revised fashion to be S2000 owner specific, posted up on s2ki.com as part of my ongoing effort as part of s2ki.com's News team. The News team is an excellent group of folks to work with and I've enjoyed every moment of contributing to s2ki.com which has helped me greatly as an S2000 owner over the years by being a treasure trove of S2000-related information resource. It has also allowed me to get to know some wonderful S2000 owners throughout the globe, making it truly an international forum in every way! Here is the article in its revised form. Faded brakes resulting in reduced stopping force remains a constant concern when attacking our favourite tracks. Spongy brake feel culminating in heart stopping moments and inability to brake well on the way back from the local track are typical. We spend hundreds, if not thousands, of dollars on modifications to increase the braking ability of our beloved rides and enjoy the results when tracking. A moment of reflection leads us to ponder if this money was well spent. Could money saved on excessive brake modifications be better used on items such as better suspension or even other safety equipment? Let's examine, by way of cost benefit analysis, and discuss the effectiveness of current expenditure regarding braking modifications and their practical impact to track day enthusiasts. 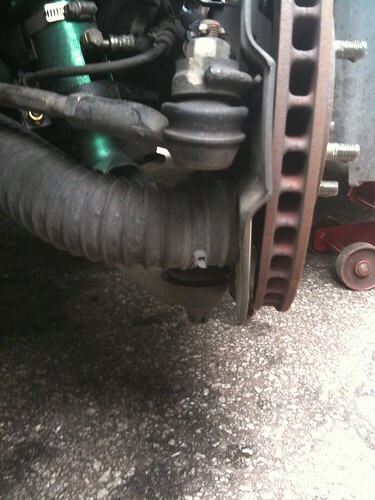 A simple understanding of the brake system is necessary for us to begin. The friction generated between the brake pad and the rotating brake disc converts the energy of the moving vehicle into heat. The heat is lost through the surface area of the disc to air when the car is moving. Buildup of heat in the disc will mean that the generation of heat is at a rate higher than the ability of the braking system to dissipate the heat of the disc. Faded brakes, spongy brake pedals, burnt discs and crumbling brake pads are all symptoms of a simple problem of accumulated heat overloading the braking system. I will use a virtually stock Honda S2000 (unmodified except for a bolt-on exhaust and slightly more aggressive alignment) tracked at Sepang International Circuit in Malaysia as a reference. Tracking the S2000 on stock brake components proved a bad idea considering the searing 50°+ C (122°+ F) track temperatures. The stock brake pads quickly disintegrated with 80% thickness pads dropping to 10% in one 3-hour track session. The stock brake fluids boiled after a few laps and remained dangerously spongy even after a long rest in the pits. The brake discs turned a funny burnt tinge after a taxing session and smoke could be seen pouring off them on entry to the pits. Upgrades to address these issues soon followed by way of Ferodo DS2500 brake pads (which are rated from 50° C to 750° C), stainless steel brake lines and Motul RBF 600 brake fluid for a total cost of about 800 SGD (equivalent to about $662 US) including labour cost (Note: Labour costs may vary from workshop to workshop). The rate of wear of the pads was halved and sponginess was staved away. Brake fluid changes could be done after every other track day although continuous lapping on the track was still limited to about five hot laps before the brake fade begin to significantly impact driving. The condition of the brake discs remained relatively unchanged. This meant the heat overload experienced by the braking system had clearly not been significantly addressed. However, certain components were now able to handle the heat slightly better. A possible reference to how much deep braking was used was that the confidence level to begin threshold braking for Turn 1 was that the driver was confident to brake just before the 100m marker while still being able to make the corner for at least the first two or three hot laps of a full five lap outing from the pits. Braking that late for the remainder of the five laps was risky as brake fade had begun to appear and by the second half the entire three hour track session it was increasingly difficult to have more than one or two hot laps before the brakes began to feel extremely spongy. The next step, to most of the tracking community, would certainly be obvious. To increase lapping longevity (to get as many hot laps per track session to maximize seat time), extensive brake modifications were necessary. 4-pot monoblock calipers, brake pads exceeding the current already high temperature ratings and bigger discs, at least for the front brakes (at a cost possibly ranging from 3000 to 5000 USD from brands such as Endless or AP Racing), would need to be fitted to generate more powerful and consistent braking. There is no doubt on the benefits such modifications confer. However, would it be possible to have approximately 80-90% of the benefits at a lower cost? Tracking isn’t the cheapest of hobbies and being cheap on vital components, such as brakes, isn’t something most enthusiasts want to be seen doing and yet the cost of a “proper brake” upgrade system is clearly prohibitive to many. Perhaps we should examine more closely our desired brake performance objectives. Upgraded stopping power is greatly desired. A simple explanation of braking “power” is that an increase in the braking “power” can be defined as a small application of force resulting in a larger than typical braking forces. 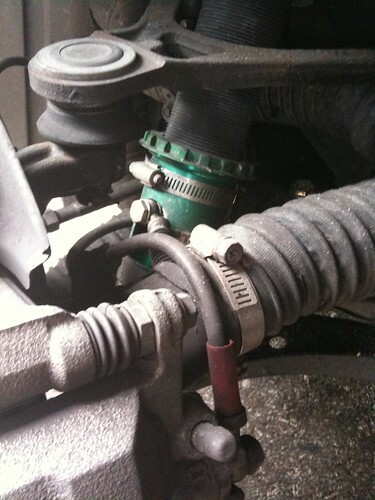 One could upgrade the brake booster (master cylinder) to get this result or simply step harder on the brake pedal. The S2000 test car with stock tyres achieved over 1G of braking in straight line braking on the front straight without the use of a big brake kit so clearly there was no lack of braking power, however, a big brake kit would greatly improve modulation characteristics under threshold braking. To address brake fade and a spongy brake pedal, another S2000 fitted a 4-pot big brake kit (including large calipers and upsized discs) from a leading brake manufacturer and achieved good consistent braking but fade still began to rear its ugly head by the end of the 3-hour track session. Brake fluids did boil a little less, fluid change intervals were slightly increased but three track sessions on the same fluids would probably be the absolute limit. A definite improvement, to be sure, but it was clear that the problem of fade still remained. Some other S2000s fitted with aggressive street brake pads and no ducting or only basic brake cooling setups tended to crack rotors much like the picture below. The S2000 test car was then modified with a commonly overlooked modification, namely, brake ducts but remained entirely stock elsewhere with the exception of the brake fluid and brake pad changes as stated earlier. The initial setup was with ducts channeling air by a regular piping to the calipers on all four corners, evolved to add a funnel head on each pipe to concentrate air flow to the same four calipers and finally to a setup where both front and rear brake discs and calipers are individually cooled with their own piping. Testing of the system was done over the course of a year with seven track days at both Sepang International Circuit and Johor Circuit, also in Malaysia, and the results were: With the same Ferodo DS2500 brake pads and Motul RBF 600 brake fluid on the stock brake system, brake pad life was increased to at least double of the usual service interval while discs ceased to smoke and exhibited no visible burn marks. The result with the brake fluids was not only that sponginess was eliminated for all the track sessions and not evident on the 300km drive back to Singapore, over five laps could be easily done without a hint of fade, braking could be done consistently on every lap at the 100m marker without fade appearing and no change of fluids appeared necessary even after the seventh track day. The S2000 test car could now repeatedly do multiple stints of over 15 hot laps without fade on the stock calipers and discs which is clearly a huge improvement in fade resistance over even usage of an expensive big brake kit. An added potential benefit, which is not immediately evident, could be that of the heat being taken out of the drive train components (such as CV joints and wheel bearings) thus reducing the heat stress on them and possibly prolonging their lifespan. Usefulness of brake ducts is nothing new in racing (virtually every race car has them) but strangely a search within some aftermarket brands concluded that you will be hard pressed to find them selling an effective and comprehensive brake duct solution in their product ranges. The downside of such a system would be some time spent to customize a proper system, maintenance of the fittings and probably some hindrance to certain modifications as the ducts would require some space to fit. The benefits are, however, numerous and obvious to the track enthusiasts. These would be namely, cost, maximizing seat (practice) time, safety and prolonging the lifespan of various components in the car. Every track day enthusiast should consider having a brake duct system in place to complement their existing brake setup. The actual cost versus benefit result derived varies from car to car, the class of competition that the enthusiast is running in and with the type of brake duct system constructed. What brake modifications have you performed on your S2000? Has that improved your braking performance? thanks for the information about brake ducting and his working.